BUKIT MERTAJAM: Bishop Sebastian Francis was installed as the new Roman Catholic Bishop of the Penang Diocese in a solemn and pomp ceremony at the St Anne's Church here. The episcopal ordination and installation ceremony was held before a congregation of more than 6,000 people from all over Malaysia. It was also attended by Pope Benedict XVI's representative Monsignor Marek Zalewski, Bishop Paul Tan of the Malacca-Johor Diocese, several bishops emeriti, as well as about 100 priests from all over the country. During Mass presided by principal consecrator Tan Sri Murphy Pakiam, who is also the Archbishop of Kuala Lumpur, Bishop Francis, 61, was ordained and installed as the fifth bishop of the Penang Diocese, replacing Bishop Emeritus Antony Selvanayagam, 77. Blessed occasion : Bishop Sebastian Francis waving to the congregation after his ordination at St Anne’s Church in Bukit Mertajam. The congregation rang with applause when the Archbishop read the Papal Bull from the Pope announcing Bishop Francis' appointment, and presented the new bishop with a Book of Gospels. Bishop Francis was then led to the cathedra (the bishop's throne) where he knelt and prayed. He then asked the faithful to continue praying for him. Also present was Chief Minister Lim Guan Eng and Information, Communication and Culture Deputy Minister Senator Datuk Maglin Dennis D'Cruz. 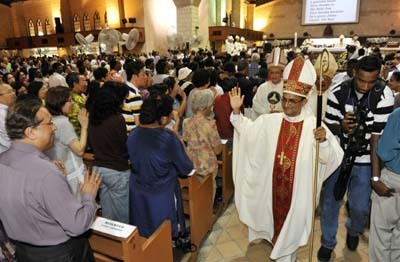 On July 7, it was announced that Bishop Francis was chosen to be the new bishop for the Penang Diocese, which includes Perak, Perlis, Kedah and Kelantan, a decision made by Pope Benedict XVI. Bishop Francis was born in Johor Baru and has been a priest for 35 years.